We welcome volunteers of all ages and abilities to get involved with the work of the BTO. 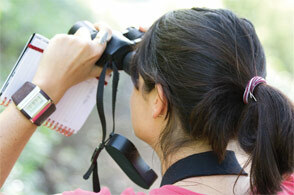 Over 40,000 people currently help us by recording the birds in their gardens or the wider countryside. The results of these surveys are analyzed by BTO scientists to provide reliable, unbiased reports that are used to inform policy makers and conservation organisations about the state of the UK’s birds. Undertaking bird surveying with BTO is a great way of learning more about the birds and other wildlife in your local area. Surveying often takes you to areas that you would not normally visit, creating excellent opportunities to expand your knowledge. It also provides opportunities to develop other skills such as map reading & habitat identification. Each region has its own BTO Regional Representative responsible for organising and overseeing surveys within that region. Regional Reps help to organise regional conferences at which volunteers can meet and share experiences. These also provide an opportunity to interact with BTO staff who organise surveys nationally. Volunteers receive updates on the results of the surveys they have participated in and how these results are being used. BTO runs regular training courses to help inexperienced volunteers develop their skills and confidence so that they may participate in more challenging surveys. The real benefit of course is that you are contributing to the conservation of our birds. Read a volunteer's view of taking part. Which surveys can I participate in? BTO organises a range of surveys every year which vary in their geographical range and complexity. Some surveys can be done by beginners from the comfort of their own homes whilst others require more skill and endurance! All of our surveys make an important contribution to our understanding of the UK’s birds. Find out more about the surveys we are currently running.